Kartik Hosanagar is the John C. Hower Professor of Technology and Digital Business and a professor of marketing at the Wharton School of the University of Pennsylvania. The co-founder of four different ventures, he was recognized in 2011 by Poets & Quants as one of the "Top 40 Business Professors Under 40." His writing has appeared in Wired, Forbes, and the Harvard Business Review, and his past consulting and executive education clients include Google, American Express, Citigroup and SunTrust Bank. Hosanagar earned his PhD in Management Science and Information Systems from Carnegie Mellon University. "[Hosanagar's] 'predictability-resilience paradox' is conveyed convincingly. He excels in arguing for an algorithmic bill of rights, one based on the original ideal of self-regulation by government and by individuals . . . Algorthimic decision making and its influence in our lives requires our attention and study." 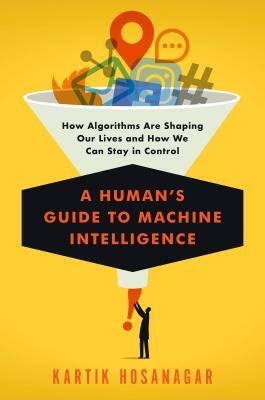 "Especially relevant to current political hot topics, Hosanagar's outstanding introduction to algorithms will appeal to and inform readers interested in learning more about the systems that determine what they're exposed to online." "Hosanagar deserves credit for valiantly attempting, throughout this thoughtful treatise, to widen understanding of a technology central to modern society." "The most useful part of the book is Hosanagar's 'algorithmic bill of rights,' which would give consumers insight into the AI that surrounds them, if not some measure of control." "Algorithms and artificial intelligence are overturning the rules of society, but their true impact is still in its infancy. Hosanagar's book is the best guide yet to understanding these digital forces reshaping our lives. Rigorous yet readable, filled with insight and perspective from one of our smartest thinkers about technology."